If you're a PC owner who's longed for an equivalent of Apple's Magic Trackpad and wireless keyboard accessories, Logitech may have you covered with its new TK820 wireless keyboard. An evolution of the company's comparitively plumper K400, the 'ultra slim' TK820 fuses a large two-buttoned trackpad onto the end that supports up to 13 Windows 8 multi-touch gestures using Logitech's SetPoint software. 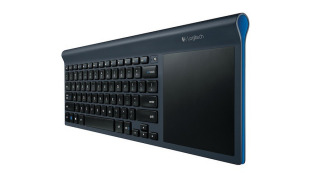 Logitech claims that its chiclet-style keyboard offers increased comfort through its proprietary PerfectStroke key system, which makes keys concave to give them a more natural feel when pressed under pinkies. Featuring a space saving design that allows you to bin your mouse, should you so wish, it may also appeal to anyone running Microsoft's tactile OS on a PC that lacks a touchscreen. The TK820 connects to a computer wirelessly using Logitech's 'Unifying' receiver operating on the 2.4GHz band, which allows up to six compatible devices to be connected to the machine at the same time. It's available now and will set you back £89.99. There's no word on a Mac version, although we wouldn't bet against one making an appearance soon.